A police officer who allegedly "fought back a smile" after shooting an affectionate dog last month announced his resignation on Wednesday. 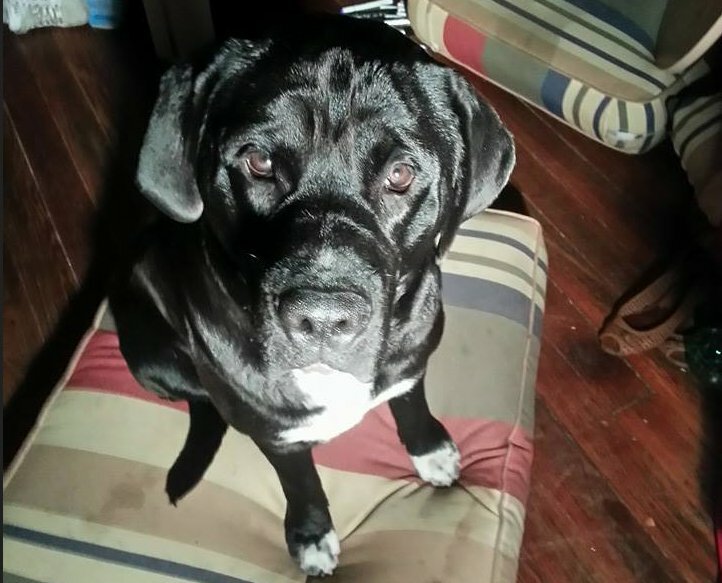 Officer Brian Thierbach of the Sulphur Police Department in Sulphur, Louisiana, is accused of fatally shooting Arzy, a 14-month-old Labrador-Newfoundland-golden retriever mix, while the dog was doing nothing but rubbing up against him. Arzy's owner, 28-year-old Brandon Carpenter, told The Huffington Post last week that he and a friend, both from Maine, were traveling with Arzy in tow to visit friends in Lake Charles when the run-in with Thierbach occurred. On April 28, the two men were walking through the town of Sulphur, Louisiaina with Arzy in tow. At around 7:00 a.m., they decided to take temporary shelter from the rain inside the back of a box truck in the near-empty parking lot of the Southwest Daily News. Officer Thierbach responded to a call from someone who spotted the men in the parking lot shortly thereafter. Carpenter said Thierbach asked Carpenter to "get your dog," then watched him tie Arzy to a nearby fence with a 3 1/2-foot leash. Carpenter and his friend were then cuffed and positioned on the ground facing away from Arzy when Carpenter says he heard a gunshot. While Carpenter could not see what happened between Thierbach and the dog, Eric Midkiff could. Midkiff, the circulation manager for the Southwest Daily News, told HuffPost last week that he drove into the parking lot at some point after Thierbach had cuffed the men. Midkiff said he stood about 20 feet away, and could see the officer standing on the back of the box truck petting Arzy. "The dog was rubbing up against the cop," Midkiff said. "He would rub the dog's back and then push him away. All of a sudden, he just jumped down and shot the dog in the head." Though Thierbach later claimed the dog bit him, Midkiff was adamant that he could see both the officer and dog clearly and that no bite occurred. "That dog did not bite that officer," he said. "The dog was wagging his tail, his tongue was hanging out." Carpenter whipped around when he heard the gunshot. "I saw the blood start to run down his face," he told HuffPost. "I'm watching my dog die while I'm sitting in cuffs." He also said Arzy, who he raised since puppyhood, was an "incredibly friendly dog" and had never acted aggressively towards anyone. "He was just a big teddy bear that you had to feed," Carpenter said. Carpenter added that Thierbach "seemed to be fighting back a smile" after the shooting, and when he asked the officer why he was smiling, he "smirked" and replied, "Well, he nipped at my foot." The Sulphur Police Department and the Calcasieu Parish Sheriff's Office launched a joint investigation into the shooting that found Thierbach "violated the Sulphur Police Department's Departmental Policy and Procedure regarding Use of Force and Personal Conduct and Behavior," Sulphur Police Chief Lewis Coats said in a Thursday news release obtained by KPLC-TV. Thierbach resigned before "final disciplinary action" was taken against him. "The resignation of Officer Thierbach was accepted so that the officers and community can heal and move forward," Coats said in the release. Art Mishler, a former colleague of Thierbach, told KPLC-TV that Thierbach is "a good guy." "He wished things turned out differently," Mishler said. "I'm sure everybody wishes things turned out differently." The Calcasieu Parish Sheriff's Office is going forward with a criminal investigation into the shooting, according to the Southwest Daily News. UPDATE: Officer Brian Thierbach has been charged with aggravated animal cruelty, a felony charge. He turned himself in on June 6.